This ordinary brick building on the corner of Lincoln and Railroad Alley stands as a reminder of the growth of business in early Spokane. 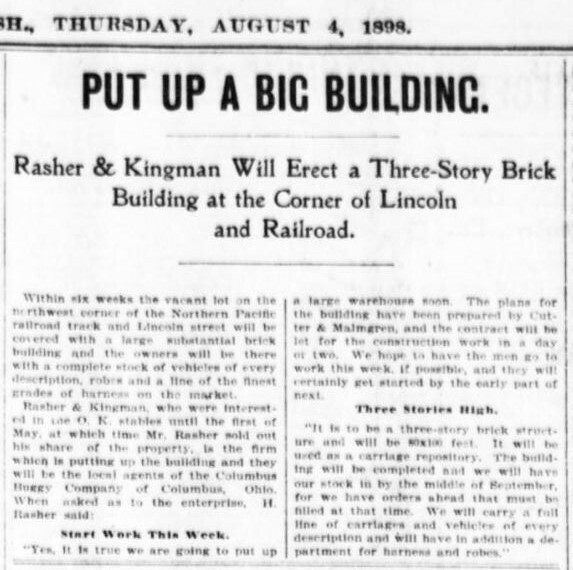 Built in 1898 by the merchants Rasher and Kingman, it is one of two buildings that remain from their partnership. It was the Spokane headquarters of the Columbus Buggy Company, one of the largest buggy companies in the world. Established in 1875 by Clinton Firestone, George Peters, and Oscar Peters, the Columbus Buggy Company made its debut in Spokane in September 1898 with Rasher and Kingman as the company's Spokane dealers. 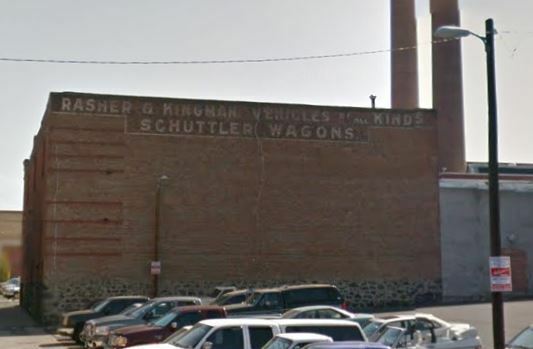 On the west side of the building, you can still see "Rasher & Kingman Vehicles of All Kinds, Schuttler Wagons" painted along the top of the building. Around the corner, on the north facing wall, you can see two signs. One for the Columbus Buggy Company, along the top of the building, and another for Child Bros. & Day. The Child Bros. & Day Company was prominent in its commercial role within the city. Since Spokane was the largest city in the region, it was the main supply center for many inland northwest farmers. Formed in 1893, Child Bros. & Day was one of several large dealers of agricultural tools and equipment, selling to local companies and regional farmers. The company was later incorporated in 1906 with stock assessed at $25,000 (several million in today's dollars). The Child brothers also made fortunes in property investment, leasing and selling properties to other Spokane businesses. Between the two Child brothers, Dana Child was the better known. Born in 1862 in Maine, Dana Child was the younger of the two brothers. Making a name for himself as a capitalist, Child and his family were often the subject of the Spokane society pages. As a prominent and wealthy member of the community, Dana Child was keenly interested in politics. He was elected as a Democratic representative of the State's House of Representatives in 1902. Well known for his political views, it was hoped by many that he would run for Mayor of Spokane in 1908. Though Child considered running, he was never an official candidate. 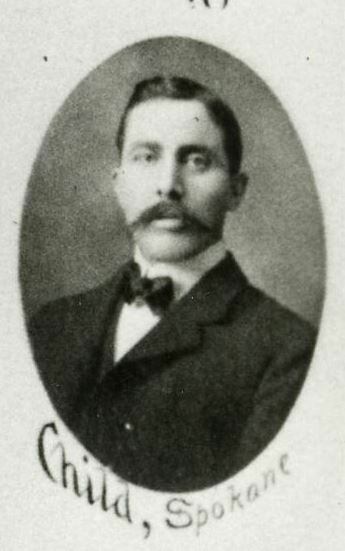 In 1909, Dana Child became the vice president of the National Bank of Commerce, a bank he helped create with partner George Day. He stepped down from this position in 1914, after being named Spokane's postmaster by President Woodrow Wilson. Child stayed politically active into the 1940s, serving as the Chairman for the Spokane Democratic Committee. Dana Child died in 1943, at the age of eighty-one. 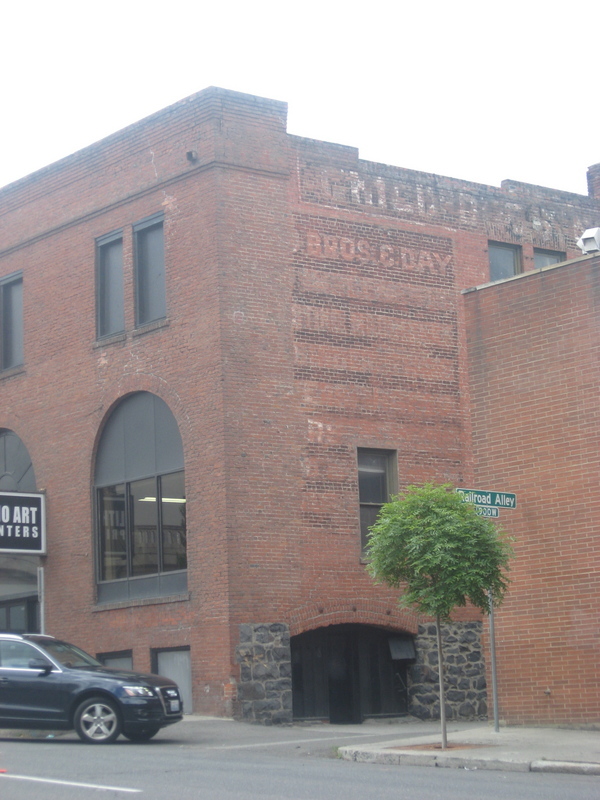 There is little left of the Child Bros. & Day Company in Spokane. Their advertisement on the side of the Rasher and Kingman Vehicles building is a small reminder of the many businesses and men that helped make Spokane a prosperous place to live. 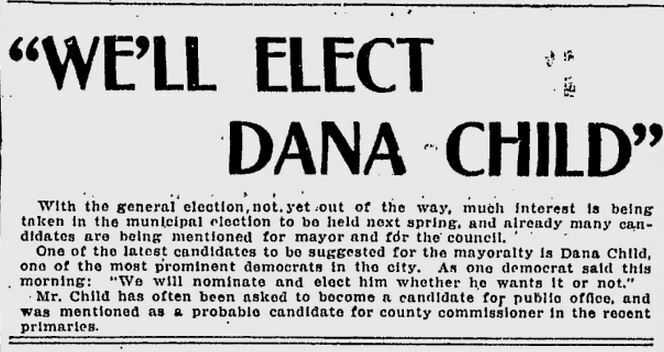 "Will Elect Dana Child," October 6, 1908: Dana Child was a popular political figure among Spokane's Democrats in the early 20th century. Image courtesy of the Google News Archive. Anna Harbine, “The Columbus Buggy Company and Child Bros. & Day,” Spokane Historical, accessed April 19, 2019, https://spokanehistorical.org/items/show/413. "Columbus Buggy Company." Touring Ohio. http://www.touring-ohio.com/central/columbus/columbus-buggy.html Spokane Daily Chronicle and Spokesman-Review, courtesy of the Google News Archive and Chronicling America.